This product provides 45-day access to the online test bank for passing the PMI-PBA Exam. The PMI-PBA Exam test bank features 800 practice questions including hundreds of situational questions, enabling users to perform practice tests to simulate the actual 175 question exam. 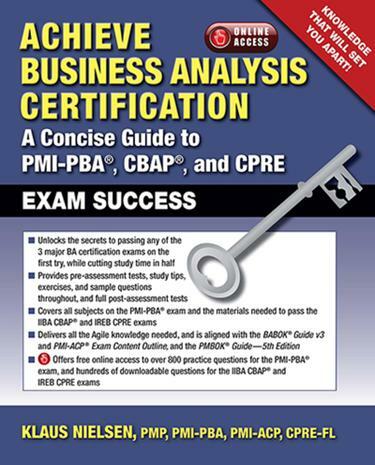 "This study guide maps the IIBAs BABOK six knowledge areas to the five PMI-PBA domains and the IREB CPRE, enabling you to re-use the knowledge to pass whichever certification you havent already earned. The practice questions and answers (with explanations) for all three exams are great!" Klaus Nielsen, partner at Global Business Development, a PMI Registered Education Provider, has more than 15 years of experience in project/program management and business analysis/requirements management. Klaus is Cambridge educated, has an MBA in both Technology and HRM, and a graduate degree in Chinese. He earned his PMP, PMI-ACP and PMI-RMP credentials from the Project Management Institute, is a Certified Scrum Master (CSM), and is ISTQB, Prince2, Managing Successful Programme (MSP), Sig Sigma, and ITIL certified. Mr. Nielsen has written numerous articles for industry publications worldwide, is the author of the book entitled I am Agile, is a frequent speaker at trade events, and is an instructor at the IT University of Copenhagen. At Global Business Development, he trains 200-300 professionals each year, and provides consulting services to businesses ranging from small start-ups to top 500 companies.